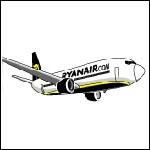 RYANAIR is to make Bournemouth its 24th European base with the launch of a number of new routes, including a new service to Nantes. I find it a bit ironic that the budget Airlines all make a big thing about the announcement of a new route, and then if the numbers don't stack up, or the summer holiday season ends, they quietly drop the route. In June last year I noticed on my blog (http://giteinbrittany.blogspot.com/2007/06/new-ryanair-bournemouthnantes-route-to.html) that RyanAir had announced the opening up of the Bournemouth/Nantes route, only in December when I looked on their website the route had disappeared, and now here it is back again. So watch this space for a similar "announcement" of a new route in 2009? I must admit it is quite a challenge keeping up with new or not-so-new routes between the UK and France.